My expression after Julie, the tech, left me with two gowns and rattled off some instructions and I couldn’t remember where the opening was supposed to be. Oh my! Today was my first ever MRI. I was nervous about it because I dislike small spaces. I’m not claustrophobic, but I avoid crowded elevators. My doctor gave me a prescription for Xanex so I could relax prior to the test and he told me to take half a pill a few days before to try it out and make sure I tolerate it well. I did that and slept four hours in the middle of the day! But, I truly believe I slept because I was emotionally drained and not because of the Xanex. Muffin and I got up early and I made sure I followed the instructions the scheduler gave me on the phone: no metal, no jewelry, no zipper, no buttons, no underwire bra, bring your mammo and ultra sound films, insurance card and photo ID. I couldn’t remember whether or not I could wear deodorant so I texted my friend who has been through this and asked her and of course, she said…NO DEODORANT. She also told me to bring some Tylenol or Advil with me because all of the banging of the MRI gave her a headache. We left for the hospital and I forgot to take the Xanex. Thankfully, Muffin reminded me and I took the other half of the pill in the car with someone’s leftover water bottle. I didn’t care…I just wanted to get this test behind me. We arrived at the hospital 15 minutes beforehand and the registration process is automated. I felt like I was buying paint at Home Depot. But, I was having a test to see if my breasts are trying to kill me….not at all like buying paint. An acutal person handed me another form to fill out specific to breast MRI and then she handed me one of those plastic pagers like you get at restaurants when waiting for a table. I thought how efficient things have gotten. A gal named Julie called my name. She told Muffin I would be back in 40 minutes. I followed Julie down the hall to a changing room. She talked as fast as she walked and when she handed me two gowns and quickly rambled off instructions, I struggled to catch what sh said. She wanted me to put on the first gown with the opening in the front and the second gown over it with the opening in the back. She left the room and I immediately panicked second guessing myself about what she said. I reasoned that they are taking images of my breasts so they are going to need access to them. I guessed right. When we got to the MRI room it was cold and super bright. The machine wasn’t a long tube like I’d expected but rather looked like a giant donut with a table in the middle. The table had three holes in it. One for my face and two more for “the girls.” Ok, now I can see how this is going down….I’m gonna lie face down with a breast in each hole and sure enough that’s how it went. It was like my breasts were fingers going into a bowling ball. The right one cooperated but poor Julie had to “adjust” the left one to get it in there right. Yikes. My bruised arm from blood draws. It’s starting to heal up now. Oh, I forgot to mention that Julie had to start an IV because she was going to have to shoot some dye in me during the procedure. 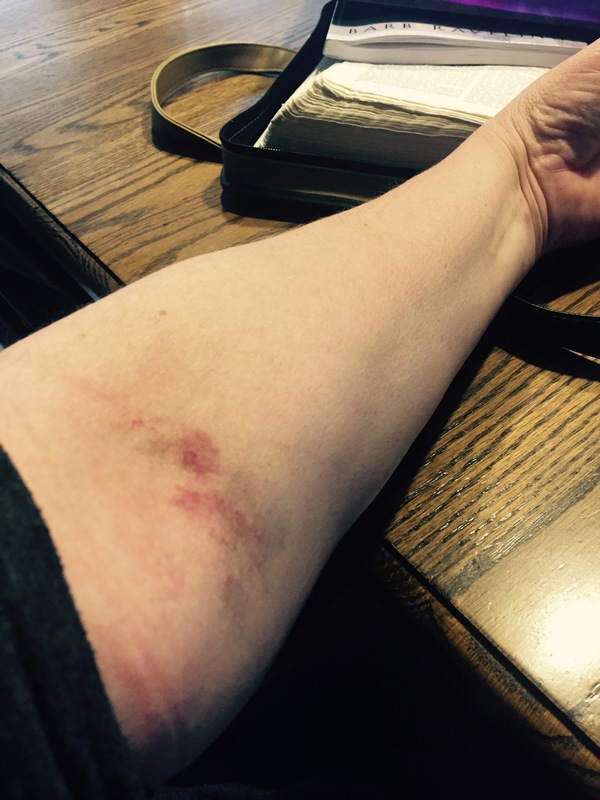 She took one look at my arms and said, “Oh boy.” I was pretty bruised from the nine-stick blood draw a few days ago. She decided to put the IV in the other arm. It was less damaged. I got positioned on the table and she started the machine. It was super loud but it didn’t hurt at all and wasn’t uncomfortable. The test took about 20 minutes. 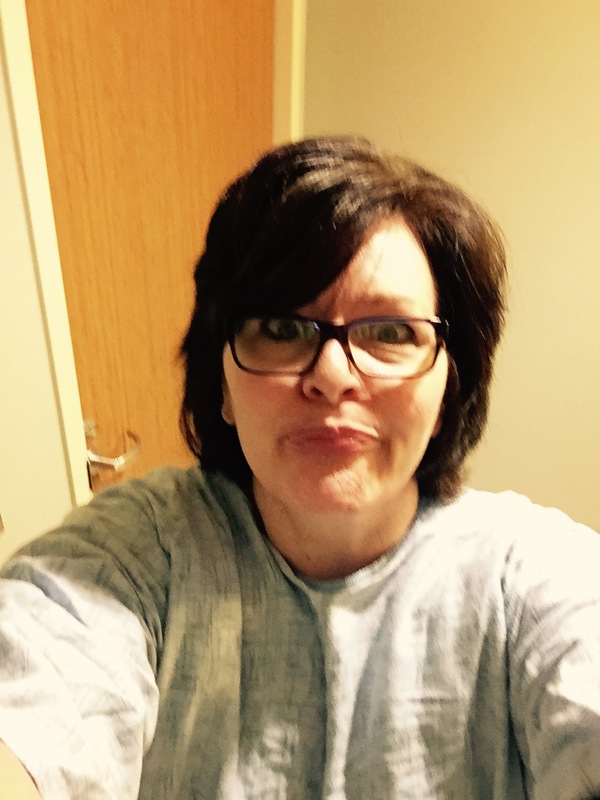 And just so you know, when she shot the dye in me, it felt like I was peeing myself….not a good feeling. Thankfully, I wasn’t, but if I had, it wouldn’t have been the first time. And that was my day. Now to wait for the results. Julie said the radiologist will read the test on Monday and I should hear from my doctor next week. I’m praying that there are no additional tumors hiding that the mammos and ultrasound didn’t pick up. The results of this test plus the genetic blood test will give us lots of information we need to determine a treatment plan. Thanks Tracy for all of your information, I’m passing this on to my daughter, maybe she will read your posts and get her mamo now 🙂 She doesn’t listen to her moma., even after I’ve gone through a double mastectomy 😕 Thanks and I’m praying for you and this tough journey, God is bigger than cancer. Hi Peg and thank you so much for your kindness and words of encouragement. Yes, please do share this info with your daughter. All women over 40 with breasts need to go once a year and given your family history, she may need to start going prior to age 40. I’m not sure on that one. But, yes…yes…yes…she needs to go! Maybe you could go at the same time to the same place. Or if you live in different areas, maybe try to schedule your appointments on the same day and text or call each other. Women like to go to the bathroom together….why not MAMMO in groups too!? Ha! I am so happy that you are sharing your journey!! There is so much misinformation in the news about mammography–when to start having them, only have them every 2 years, only have them every 5 years, etc. The American College of Radiologists still recommends women have annual screening mammograms. Every now and then a “study” will come out in the news and then women are confused about when to have mammograms. The government is still allowing women to have yearly mammograms. Please continue to spread the word!!! You are living proof of how important yearly mammograms are. Early detection is so very important! My prayers are with you on this journey!! Hi Mary and THANK YOU so much for your friendship and prayers. I’m smiling right now just remembering the fun we had at Grace at the comedy event. Praise the Lord! What a fun group. I have some cancer material now. He he he. God is soooooo good! I’m on the same journey. Might be slightly ahead of you. My lumpectomy is behind me and I’m waiting for healing to start radiation. Early stage, surgery found excellent results, and mine was also found from my annual mammo. Hi Pam…Hope you’re feel better and better each day! This can be an awesome journey with the right perspective. God is good. Thank you for sharing. So many people are open to sharing their cancer journey, that it really does help raise awareness and let people know that there are treatments available and life after cancer. Hi Gabrielle…Yes, that’s exactly how I feel. Before I learned about my own treatment, I viewed cancer as a death sentence, but it’s just not like that anymore. Thank God! Mammograms are so important! !